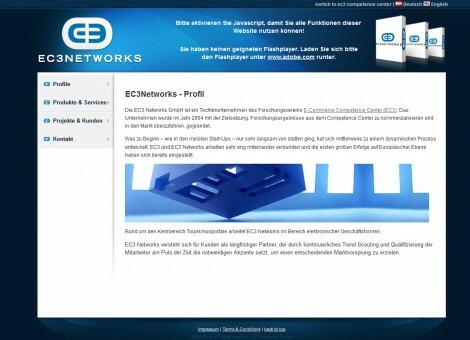 EC3 Networks GmbH is a spin-off company of the research centre E-Commerce Competence Center (EC3). The company was founded in 2004 with the aim to commercialize research results of the competence Centre and bring them to market. As in most start-ups, this started slowly but could meanwhile develop to a dynamic process. EC3 and EC3 Networks work closely affiliated and could already score great success on European level. Around its core area of e-tourism portals (please see “Country Portal for Finnish Tourism”, “www.visiteurope.com” and “Picture Profiler”) EC3 Networks predominantly engages in the field of electronic commerce. EC3 participated in Harmonize-Projects (“IST-Project Harmonise” and “eTEN-Project Harmo-TEN”, please see below) and furthermore it deals with data-interoperability and data-exchange in its projects “SEMAMO” and “MEMESE”, which you can find briefly described below. EC3 Networks could already contribute its know-how and service to many interesting projects. Below a short description of selected projects that EC3 Networks has realised successfully regarding e-Tourism as well as in the context of Harmonise. Country Portal for Finnish Tourism: EC3 Networks can compete in a public tender on European level and is commissioned with the relaunch of www.visitfinland.com or the Finnish Tourism Association (MEK). Picture Profiler: Based on a prototype, EC3 Networks develops the Picture Profiler which is first used in practice for day trip selection for the tourism association of Upper Austria (Oberösterreich Tourismus). www.visiteurope.com: In a European-wide public tender EC3 is successful against about 70 competitors and is awarded with the European Commission’s order for the development of the European Tourism Portal. This about two million Euro project has first been presented to the public at the conference of the tourism ministers at the Viennese Imperial Palace (Wiener Hofburg). SEMAMO: The objective of the SEMAMO (Semantic Market Monitoring) project is to make use of the increasingly growing information available at Web-based sales and marketing channels for market research, using semi-automatic analyses driven by semantic application domain models. The assumptions are that the Web may serve as a representative “picture” of the reality, and that the respective online channels map salient market developments in terms of product descriptions, distribution, promotions, and price developments; and all of this both quite accurately and in a timely manner. MEMESE: The goal of the MEMESE (meta-meta-search-engine) project is to develop a generic, domain-independent meta-search engine that can be applied easily and fast to the specific needs of a particular domain. In order to realize this goal, the project has been split into two major parts. The focus of the first part is on the development of an infrastructure for the domain-independent meta-search engine while in the second part the development focuses on the application of the engine to a particular problem from the transportation and logistics. Furthermore EC3 Networks has been involved in the already mentioned projects Harmonise and Harmo-TEN.